Movement Monday: Are your ribs moving when you breathe? One of the things I find most challenging for people from all walks of life (musicians, movers, etc.) is getting the ribs to move while breathing. It seems intuitive, but many of us are limited in our lateral breath movement, which affects our whole body, not just our nervous system or lung capacity! I've noticed that many of my wind player friends breathe very clavicularly- taking short quick breaths, which are definitely needed sometimes in music, but perhaps not all the time, and definitely not in daily life. The natural movement of the ribs side to side, and front to back, not only allows the lungs to fill up, but also encourages healthy movement of the restorative diapraghm, spinal movement, and more. I've seen this exercise in a few different permutations- with a yoga strap, with a knotted theraband, and so forth. I like the theraband (if you have one), because the band itself expands as you move, whereas the yoga strap resists movement. Conversely, use what you have access to! I also like to change the tension of the band to encourage my ribs to move more (or less) accordingly. "Live the Dream," pssh...I'd rather breathe better. I realize that the topic of Spanx may seem outside the scope of the blog (now I'm telling people about undergarments? ), but I promise there's a logical explanation. When most women prepare for a recital or fancy engagement, there are usually a few concerns: the fancy dress, the fancy shoes (usually heels, much to my chagrin), and what to wear under the dress (often spanx). Now I've ranted at length about the perils of performing standing in heels, but did you know that those spanx aren't helping anything either? The combination is actually a bit of a biological nightmare, especially when coupled with performing and needing to breathe. So what's the problem? 1. Spanx and other minimalizing garments push your viscera into your diaphraghm and belly. Basically, your squishing your wobbly bits inside of you, or pushing in and up. 2. This pressure can make breathing more difficult, and depending on the undergarment, prevent diaphragmatic breathing and fully belly expansion. In addition, the pressure compromises digestion (hello, acid reflex!) and puts extra strain on the pelvic floor. Sara Blakely, owner of Spanx, rocking the garments and the heels. I feel pity for her innards. 3. Compressing garments are like orthotics for your belly, encouraging your core muscles to just check out completely instead of supporting you in a normal engagement pattern. 5. When women wear heels, their spine and pelvis are out of alignment as well as causing mayhem for the pelvic floor muscles. (Neutral pelvis is best for pelvic floor strength!) Then remember that heels also compromise your ability to use your respiratory diaphragm...which you definitely need when performing, no matter your instrument. Couple that with an elastic corset cinching your bits, and you've got a respiratory disaster! So I'm sure I've ranted before that musicians should take anatomy/physiology classes and learn a bit more about self-care, but more importantly, let's look at some of the most frequent myths I get to bust in lessons, classes, friendly conversations, and emails. A lovely small image from Gray's Anatomy. 2. Your core refers to your abdominals exclusively. I despite this misunderstanding, perpetuated by the fitness realm of "burn," "shred," "melt," and "tone," your abs. Your core, refers to the entire muscular sheathing of your viscera and spine, which includes your abdominals (6 pack, obliques, transverse), back muscles, diaphraghm, psoas, and more, depending on your definition. Some folks define core as include hip musculature too, so that's open for debate. Either way, your 6 pack is not your core, although it is part of it, and doing sit-ups will not invariably cure back pain although strengthening the whole core might help. 3. Your fingers start at your knuckles. Nope. While this is not intuitive, the bones that make up your metacarpals and phalanges originate at your wrist. Your wrist position while playing your instrument directly affects your ability to use your fingers, and when you think of fingers articulating, they begin their articulation from the wrist. In addition, your have minimal musculature in the hand, but instead the bulk of your musculature in your forearms. 4. Your respiratory diaphraghm cannot be stretched. So your diaphraghm is a muscle, which means that it can be tight, loose, weak, and strong, in various degrees. Your diaphraghm is also a muscle nestled within your rib cage which helps your lungs to inflate and deflate. In addition, the muscles around your ribs can also be tight, loose, weak, and/or strong, which also affects your respiration. There are interesting ways to stretch your diaphraghm (for another day-ooh la la!) as well as open up the muscles on the sides of the ribs, which can help your breathe more easily and more fully (good for most musicians and people at large). PS. The narrator in this video has a hilarious accent. 5. The tongue is one big muscle. 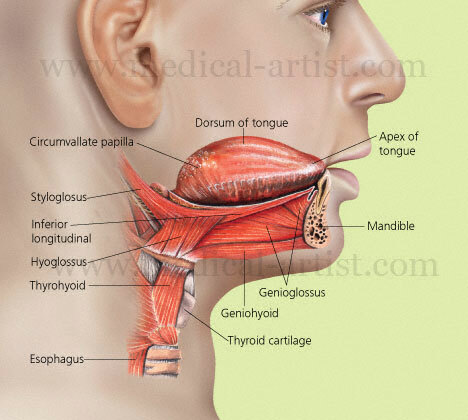 Your tongue, ladies and gentleman, is a structure composed of eight separate muscles, attaching at various bones including the hyoid bone, mandible, and styoid process. Without dwelling on the anatomy too much, take a look at this picture and be amazed! 6. Standing with my feet turned out is natural. Nope. I've had a chat about this before, especially in relation to violin pedagogy, but here are a few thoughts. Just because everyone does something, doesn't mean it's natural. Everyone currently sits 6-8 hours a day, but that's not biologically natural. Just because everyone turns out their feet doesn't mean that's natural either. The more you turn out your feet and legs, the more likely you hyperextend your knees and flatten your pelvic/low back curves. When your feet face parallel (or close), you walk in a manner that is more biomechanically sound for feet, knees, and hips, and can help change your pain patterning. 7. Sitting, standing, and playing with poor posture won't affect my long term body health. Nope. I've talked about this a lot, and I'm sure it gets boring to read about, but the way you move affects your tissues! 8. Wearing High Heels Regularly Won't Affect My Body. This is a biggie. If you only wear them to sit in, then sure, you might be ok. Walking and standing in them regularly will affect your alignment, your back, your knees, and possibly cause you bunions. Save them for super special occasions and don't regularly concertize or audition in them. 9. Many of the great players had ridiculous setups and strange posture. They didn't hurt -why can't I play that way? In regards to string technique, much has changed in the last fifty years. We no longer teach to learn how to play, but we teach folks (hopefully) in a way that not only imparts knowledge of how to play an instrument, but how to play it sustainably for a long time. I can't know if famous musicians of the twentieth century were ever in physical pain from playing. My guess is, yes, they were in pain sometimes, and no, there weren't an abundance of tools at their disposal for improving their setup. My friend Molly Gebrian said this quite eloquently last week: "Great players played well not because of their (idiosyncratic) technique, but in spite of it." That means you don't necessarily want or need the setup of famous 1940's violinists. 10. If I just take an anti-inflammatory drug, all of my wrist/arm/shoulder/back pain will go away. So if you just treat the symptom (pain/discomfort/tingling) and don't address the cause (misalignment, tension, overuse, too much playing, poor sleeping/standing/sitting alignment, etc.) the pain will most likely be chronic. NSAID's can be important sometimes in treating serious inflammation and wounds, but we often medicate without thinking of the obvious thing: our body has an inflammatory response to treat tissue damage for a biological reason. Maybe reconsider the next time you reach for the Advil, and instead ask, "why do I hurt?" and "Is there any other way I can treat this right now?" While the body is a complex and interesting structure, many of our bodily misconceptions have affected how we play and how teach. If one of these concepts resonated with you (pun intended), think of how it can help your students and your own practice!